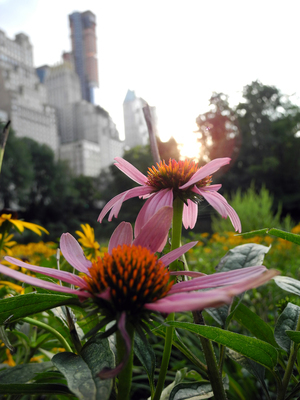 Coneflowers in New York City's Central Park. Credit: Catherine Ward. A Master Plan guides the orderly development of cities, towns, or regions and should be the result of a strong community visioning process. Once adopted, it guides development in ways both big and small, through both presenting the shared community goals and influencing legal documents such as zoning code. It should be updated every ten years, and it is advisable that it be consistent with regional plans or guidelines from the state. Many different elements go into a master plan, such as open space and housing. Climate change is another element that should be considered as core data and integrated into the plan. 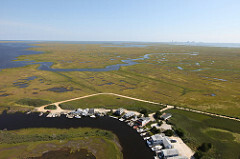 Coastal community on the edge of vital salt marsh habitat in the Edwin B. Forsythe Natural Wildlife Refuge. Credit: Lia McLaughlin/USFWS. Land Use Plan that identifies present land use and designates the proposed zoning, location, and inter-relationship of public and private land uses. This element relates the proposed standards of population density and building intensity to the capacity of land available or planned facilities and services. The land use plan can incorporate standards that consider climate change mitigation and adaptation actions, such as preventing building in current and future floodplains and requiring urban greening for cooling near denser development. Housing development that identifies and analyzes existing and forecasted housing needs and objectives including programs for the preservation, improvement and development of housing. This element shall identify policies and strategies to provide a balance of local housing opportunities for all citizens. For example, climate considerations may influence where housing should be located and whether heating and cooling and elevator mechanicals are on the ground floor of public housing. Economic development that identifies policies and strategies for the expansion or stabilization of the local economic base and the promotion of employment opportunities. Climate resilience, including natural systems, can be important to protecting businesses in the town or city. Natural and cultural resources inventory that provides a portfolio of the significant natural, cultural and historic resource areas of the municipality, and policies and strategies for the protection and management of such areas. These should include consideration of climate change’s effects on species distribution as well as ecosystem services?. Open Space and Recreation Plan element that provides an inventory of recreational areas, resources, and open space areas of the municipality as well as policies and strategies for the management and protection of such resources and areas. One opportunity many communities see is to combine open space with climate provisions, such as floodable parks to address stormwater and similar opportunities to combine goals. Open spaces can the first line of response for many climate change issues, and protection and support of them can improve resilience. Services and facilities that identify and analyze existing and forecasted needs for facilities and services used by the public. Vulnerability and hazard planning can be important here. Transportation Improvement and Circulation that provides an inventory of existing and proposed circulation and transportation systems and possible changes in accordance with the Transportation Improvement Plan. It is helpful to assure that these systems work well with disaster planning. Climate Adaptation Plan that could be incorporated as a stand-alone document or chapter that includes its own introduction and vision, climate projections and vulnerability analysis, actions and strategies, implementation matrixes and monitoring. Implementation program that defines and schedules the specific municipal actions necessary to achieve the objectives of each element of the master or study plan. Climate thresholds can be useful here, and can be based on experience rather than highly scientific measures. For example, the town may decide that if there are more than five excess heat days a year, they will install air conditioning in all elderly housing; after an area has been flooded three times in a three year period, no municipal dollars will be invested in infrastructure there; and similar decisions. Discussing these in advance can enable a swift response as climate changes. 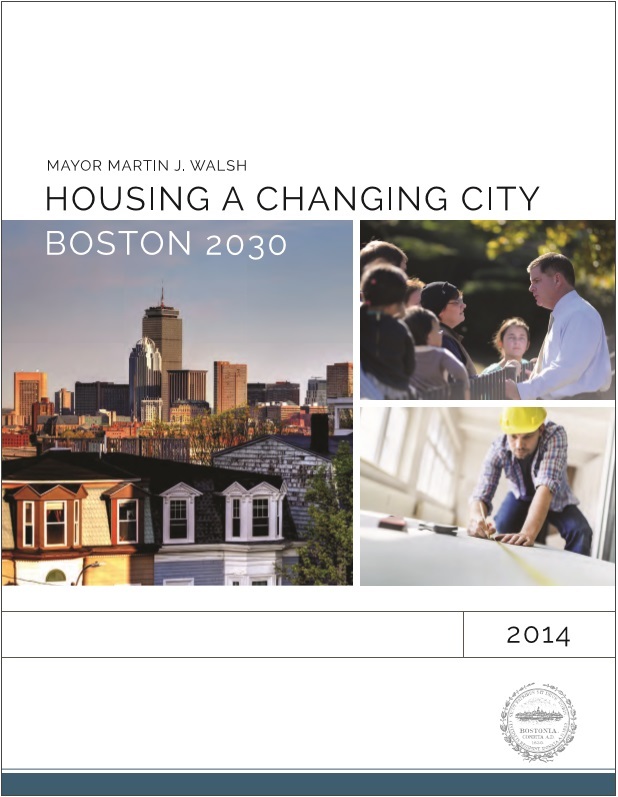 Housing a Changing City, Boston 2030. Credit: City of Boston. 1. Review and appraisal of each element and can be assembled in climate, demographic, social, economic and physical environmental profiles. This part evaluates the needs of the community, previous interventions and visioning for the future of the community. It involves public participation and community engagement. Projections for climate impacts may be very helpful to present to the public and include in this initial data gathering, so that this information can be used throughout the process. 2. Develop a preliminary master plan with detailed proposals and actions and consider possible options to be developed in a report that will be submitted for the planning board. Great plans will connect the wide range of benefits communities want, such as safety from hazards, livability, natural resource protection, and find practices that achieve multiple goals. 3. Detailed design and consultation: This is the refinement and development of strategies to be presented to the public, including implementation actions for the land use plan as well as social and economic development. 4. Compile final integrated master plan proposals: Publication and regeneration of master plan and implementation. Climate change adaptation proposals can be included as its own chapter in the Master Plan or integrated throughout the plan. Sustainable Northampton, Comprehensive Plan 2008 – 2028. Master Plan 2014, Town of Hudson, MA. Arlington Master Plan 2015, MA. 3. Qadeer, M. A. (2012). Urban Development. In B. Sanyal, L. J. Vale, & C. D. Rosan (Eds. ), Planning Ideas that Matter. Livability, Territoriality, Governance, and Reflective Practice. Cambridge, Massachusetts: The MIT Press.